Texo Group, the technology-led Integrated Asset Services specialist, has bolstered its already highly experienced engineering leadership team with the appointment of additional industry specialists, to help meet its growth in project opportunities and to head up its new office in the North East of England. Andy Kay (Managing Director), Garry Kennie (Engineering Director) and James Allan (Operations Director) are now joined by David Stark, James Russell and Andy Lovell. David Stark assumes the position of Construction Director, James Russell has been appointed as Equipment Director and Andy Lovell joins as Sales Director. James Russell and Andy Lovell will be based at Texo’s brand new Port of Blyth facility in the North East of England, where they will spearhead the development of the Group’s Renewable Energy and Equipment Supply strategy. Andy Kay, Managing Director, Texo Engineering. James Allan, Operations Director – Fixed Platform specialist. Garry Kennie, Engineering Director – MODU specialist. David Stark, Construction Director – Oil and gas asset construction specialist. James Russell, Equipment Director - Renewables and equipment specialist. Andy Lovell, Sales Director – Renewables and equipment specialist. Andy added: “We have a carefully assembled team of specialists with outstanding reputations within their respective sectors. Our engineering capability and expertise extends to upstream, downstream oil and gas through to clean energy, renewables, nuclear and critical infrastructure. 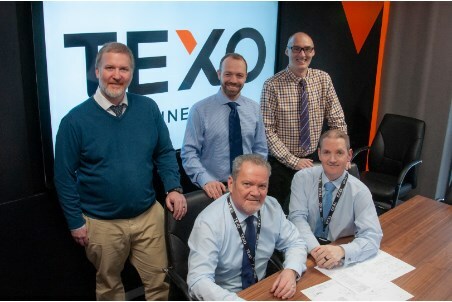 The new office in the North East of England will service the needs of Texo’s extensive client base; focusing on back-of-deck and mechanical equipment projects, as well as supporting the needs of the offshore wind sector. Texo, which was formed in July 2018, has already won and completed several high value complex engineering projects and is soon to announce a number of new contract wins. The engineering and technology group has been created in response to the market need for an experienced and highly skilled multidisciplinary engineering team, to deliver integrated technology-led asset services. This full turnkey offering combines engineering with in-house fabrication, rope access, painting, inspection and NDT, along with mechanical equipment design and supply.